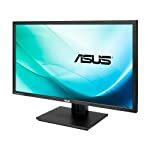 So, you’re thinking about buying a 28″ monitor, with a 4K resolution and FreeSync support? Well that’s lucky because that’s exactly what Samsung have packed into the U28E590D. It is similar in many ways to it’s little brother the U24E590D but note this screen has 10-bit colour and a TN based panel. Whilst TN panels offer superior refresh rates they tend to have poorer colour performance, particularly when viewed from unusual angles. 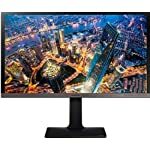 They also tend to be cheaper which makes this 28″ display an affordable option for anyone looking to break into the 4K gaming arena. The cost of 4K gaming continues to fall, and whilst not mainstream yet, it’s starting to move out of early adopter territory and onto the enthusiast gamer’s wish list. Samsung have managed to build a well balanced monitor here that offers great colours and fast response time at a price that puts 4k into the reach of mortals. Samsung do a good job of creating good looking displays and the U28E590D is no exception. Given that many of the early 4k monitors are distinctly unattractive this goes a long way in it’s favour. Looks are always subjective but I think this is a smart looking screen with minimalist features, cool lines and a fairly thin bezel to frame your display. This is a screen that will look good in a casual or professional setting. Connectivity includes both DisplayPort 1.2 and the modern HDMI 2.0 standard. 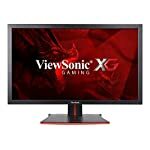 Either will be able to support 4k gaming at 60hz. There are no USB ports so if that’s important to you then you’ll have to be willing to do without – I think most of us can live without! The display features a matt display, this helps to reduce glare and seems preferential to me although some people prefer a glossy look on their screen. The Samsung U28E590D utilises AMD’s FreeSync technology so ideally you’ll be matching this up to a modern AMD graphics card. You’ll need a decent high end GPU to get the best out of a 4k screen – that’s a lot of pixels you’ve got to push round the screen! FreeSync is designed to give you smooth tear free gaming by synchronising the frame rate of your monitor to the frames output by your graphics card. The display scores well in colour reproduction showing excellent results in both the sRGB and AdobeRGB color gamut ranges. But do note this is a TN based screen which means the colour accuracy distorts when viewed from obscure angles. Samsung have done what they can to minimise this problem but it is still there. But remember, the TN panel does keep the cost of this monitor down so it is a compromise worth making if you don’t want to break the bank. We give the Samsung U28E590D a 4 out of 5 rating. Want to know what existing owners of the monitor think? You can read real user reviews here. 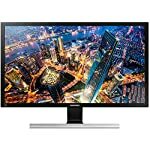 Should I buy the Samsung U28E590D? The U28E590D is a well priced entry level 4K screen. 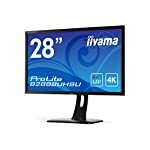 At 28" this is a good size to consider for high resolution gaming, the TN panel might put some off but it does provide fast refresh rates and helps keep the cost down. If you are having some doubts about this purchase then why not read some real owner reviews and see what other buyers think.